Nothing says “Spring” like lemon and coconut. 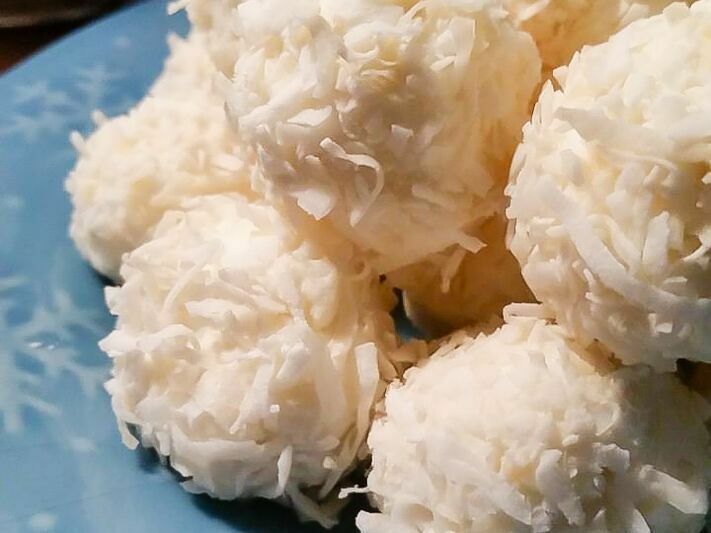 These melt-in-your mouth truffles will be a delight at any Spring or Mother’s Day gathering... Pearl Chats:“My daughter Meadow has a way with Trim Healthy Mama desserts. She constantly comes up with scrumptious (and kind-to-the-waistline) sweet treats. Our whole family is only too happy to sample. This is one of my favorite recipes of hers. This recipe is found in the "Sweet Treats - Candies and Bars" section of the Trim Healthy Mama Cookbook, page 386. This recipe is a multiple-serve recipe. In a medium bowl, mix all the ingredients except the coconut. Roll the mixture into little balls, then roll the balls in the coconut. Place the truffles on a nonstick surface, store in the freezer until serving, then allow to sit out for 10 minutes or so for the best texture. This is a NSI (No Special Ingredients) recipe if you use a store-bought, plan-approved sweetener.